Volvo’s North American CEO, Lex Kerssemakers, lost his cool as the automaker’s semi-autonomous prototype sporadically refused to drive itself during a press event at the Los Angeles Auto Show. Tesla CEO Elon Musk recently called the mundane issue of faded lane markings “crazy,” complaining they confused his semi-autonomous cars. 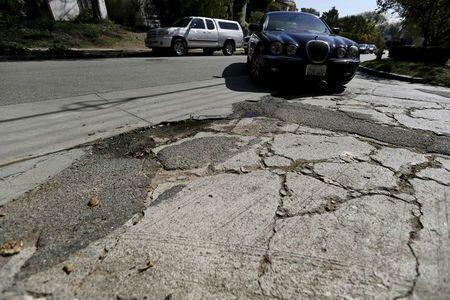 An estimated 65 percent of U.S. roads are in poor condition, according to the U.S. Department of Transportation, with the transportation infrastructure system rated 12th in the World Economic Forum’s 2014-2015 global competitiveness report. Tesla, Volvo , Mercedes , Audi and others are fielding vehicles that can drive on highways, change lanes and park without human help. But they are easily flummoxed by faded lane markers, damaged or noncompliant signs or lights, and the many quirks of a roadway infrastructure managed by thousands of state and local bureaucracies. In other developed countries, greater standardization of road signs and markings makes it easier for robot cars to navigate. In the U.S., however, traffic lights can be aligned vertically, horizontally or “dog-house” style in two columns. Pavement markings use paint with different degrees of reflectivity - or don’t exist at all. To make up for roadway aberrations, carmakers and their suppliers are incorporating multiple sensors, maps and data into their cars, all of which adds cost. Boston Consulting Group estimates that initial semi-autonomous features add $4,000 to a car’s price. It estimated carmakers will have to spend more than $1 billion over the next decade in research investment for even more sophisticated autonomous features. On a good road in daylight, cameras installed around a car are sufficient to distinguish road lines, traffic lights and signs. But without lane markings, the car needs more technology to judge its position. Enter radar and lidar, which send out radio waves or light pulses to bounce off objects. The data sent back informs the car about objects, their distance and velocity. Triangulating between trees to the right, boulders to the left, and other vehicles ahead, for instance, can give the car its bearings. A host of companies - including Silicon Valley firms Quanergy and Velodyne and international suppliers like Paris-based Valeo - are vying to reduce the cost and size of lidar from the bulky, $75,000 Velodyne version first seen on the roof of Google’s self-driving car. In January, Quanergy unveiled a small $250 Lidar with no moving parts. Automakers want the price to drop below $100 for production vehicles, which Quanergy promises to do by 2018. Sub-par roads are fueling efforts by companies such as Germany’s HERE and Dutch company TomTom to create three dimensional maps that can provide the car’s location on the road within centimeters, said Chris Warrington, CEO of mapping technology company GeoDigital. Automakers are looking to pay $50-$60 per car for such maps, which may be well below the actual price, said Warrington. “We know they’re coming, but they don’t exist yet. That’s why lane markings are so important now,” said Gary O'Brien, director of advanced engineering for automotive supplier Delphi Automotive Systems PLC. O'Brien snaps photos of bad roads when he travels. “Look at this, there are no lane markings at all!” O'Brien said, showing a picture he took on a desert road in Bluff, Utah where the demarcation between the road and ground is barely visible. Some officials envision traffic signals that communicate with cars at dangerous intersections and vehicles that can signal each other their positions, direction and speed. The U.S. Department of Transportation’s "Smart City Challenge,” a competitive grant program, will offer up to $40 million this summer to help one city integrate new technologies, which could include infrastructure for self-driving cars. The Transportation Research Board, an independent group that advises the government, plans to issue recommendations for standardized lane markings for machine vision by 2017. By then, several automakers say they plan to offer models with some form of autonomous highway driving. Paul Carlson, a research engineer focused on infrastructure at Texas A&M University, said he gets calls from transportation officials asking how to accommodate robot cars.